Durdle Door is a world famous geological wonder, with its massive rock arch, set right on the Jurassic Coast between Swanage and Weymouth, just along the coast path from Lulworth Cove, it is absolutely beautiful. 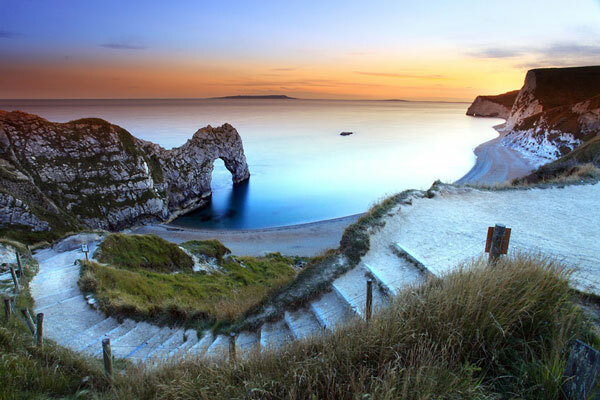 Durdle Door has a sloping beach for bathing or snorkeling from, caves and exciting rock strata. Only a short walk from Lulworth Cove and makes a nice place to have picnic, sunbathe and go swimming, there was once a dolphin in the bay! It does require a good walk up and down so wear some good shoes!